Are Russians immune to freezing and frigid temperatures? From time to time, Russians like to tell anecdotes about their ability to tolerate low temperatures. People sometimes make assumptions that Russians aren’t affected by wintry weather because Russia is such a cold country. This is false. Russians, like people of any other nation, do not enjoy extremely low temperatures. However, there are some examples where Russians have demonstrated amazing resistance to the cold. For Valery Malkov, a truck driver from Bratsk (3840 km east of Moscow) it began as an ordinary January day in 2013. He was traveling by train from Bratsk to the small town of Aldan (4914 km east of Moscow) in search of a part-time job, which was something he did several times a year. This particular night he decided to leave his compartment to go smoke a cigarette before going to sleep. He began to open the door to return to his compartment when, all of a sudden, he realized two very important things. First, the door he was opening was not the door to his compartment but was actually the exit at the end of the train’s caboose. Second, this door was unlocked. The next thing Malkov knew, he had fallen out of the train and landed on the railroad line. He found himself in the middle of nowhere surrounded by the Siberian taiga in minus 40 degrees Celsius frost, dressed only in his sweatsuit and slippers. As he would later say, the situation did not leave him with much of a choice. 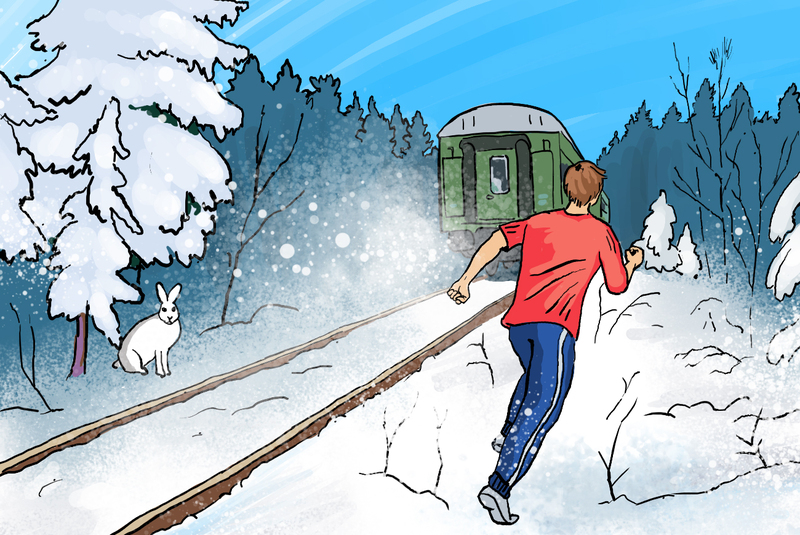 He began to run after the train. He ran for 7 km, without letting himself think about death or cold and, after half an hour, made it to the closest station where a shocked officer let him on board and offered him several cups of hot tea. Though he stated that the next morning he “kind of rethought his life,” Malkov did not even catch a cold as a result of this experience. It may seem that Valery Malkov’s astonishing story is very typical for cold-tolerant Russians, but this is a wild tale, even in this country. From time to time, Russians like to tell anecdotes about their ability to tolerate low temperatures. One of these goes: when it’s 42 degrees below zero Celsius, transport systems collapse in Europe, while Russians eat ice cream outside. However, these tales about Russians in the cold are hardly different from the tales you might hear from any other nation, excluding those who never experience winter and snow. For example, a Livejournal user nihon81 recalled a British colleague of hers who used to live in London. She said that he was far more accustomed to the cold than she was because he was used to living in a London house that lacked central heating. She also recalled Japanese youth who had surprised her with their ability to walk around in winter without their coats. Surprisingly, these people also seemed to be less susceptible to the cold than a native Russian. It is true that Russia is indeed one of the coldest countries on Earth, with an average national annual temperature of only 1.69 degrees Celsius (2016). Alexander Belyaev, the deputy director of the Institute of Geography at the Russian Academy of Sciences, explains it as follows. Russia is situated in the north and lacks mountain chains that would protect the country from Arctic winds. Meanwhile, the Caucasus is situated on the southern frontier of Russia and the Ural Mountains stretch from north to south. Additionally, there are no warm ocean currents in any of the seas that surround Russian territory, which leaves much of the country exposed to ice-cold Arctic winds. It is no surprise that both so-called “Poles of Cold” that are located in the northern hemisphere are in Siberian Russia. These poles are Verkhoyansk (4678 km east of Moscow), where the coldest temperature of minus 67.6 degrees Celsius was recorded in 1892 and Oymyakon, (5298 km east of Moscow) where an even lower temperature of minus 67.7 degrees Celsius was measured in 1933. Despite this, people still live in these towns today.